The Elite RealTour is part of Elites Real turbo trainer range, and is a completely wireless system that monitors and varies a host of cycling metrics automatically. The RealTour fits with Elites Real software and provides you with videos to race through, data outputs, web races and more. The Elite RealTour uses an electro-magnetic resistance unit that can simulate slopes of 6% (power output of 500 Watts at 30km/h). 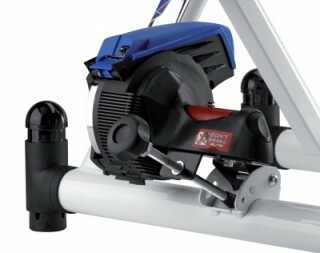 For greater 20% slopes and high power at low speeds (500 Watts at 15km/h) see the Elite RealPower turbo trainer. The RealTour has an oversized Elastogel resistance roller that reduces rear wheel tyre wear by 20% and noise by 50% over conventional turbo trainer rollers. 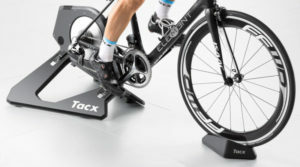 Also, for added realism to your rides the trainer comes with special 'dancing' support legs that allow the turbo trainer to tilt and rotate as you get out of the saddle and push yourself up those steep mountain terrains. The Real software that the RealTour cycle trainer uses automatically varies the trainer resistance as you ride some of the most famous courses in the world, such as stages of the Tour de France and the Giro d’Italia. As your speeds increase you move through the RealVideos faster, meaning you can pace yourself and try and complete stages in direct comparison to some of the cycling greats. Important race and performance data such as speed, power, heart rate, cadence, incline, and race time are all displayed in real time on your PC or laptop. The Real software also comes with user-adjustable training programs, Google Map races, web races against online (real human) opponents, GPS data import from your own routes, and other exciting features. 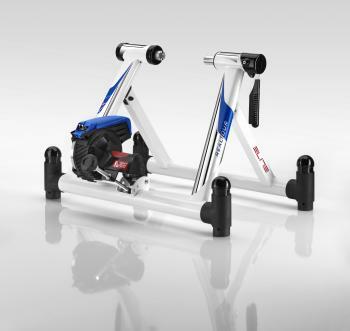 See Elite’s website here for more details on the RealTour trainer and the Real software.